An all-purpose vitamin and mineral supplement for beef cattle on pasture that complements a wide variety of forages to meet basic nutrient requirements. Includes Aureo for control of Anaplasmosis. CAUTION: Beginning January 1, 2017, Federal law restricts medicated feed containing this veterinary feed directive (VFD) drug to use by or on the order of a licensed veterinarian. 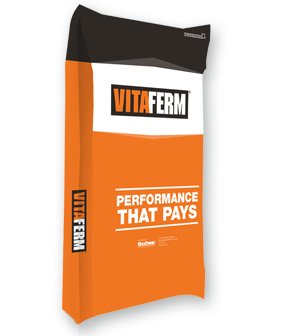 Provides an economical vitamin and mineral supplement that is formulated for the grazing season, but is versatile enough to be fed to a variety of ages and stages. Includes Aureo for control of Anaplasmosis. Amaferm® is a precision prebiotic designed to enhance digestibility by amplifying nutrient supply for maximum performance. It is research-proven to significantly increase forage digestion increasing pasture utilization resulting in optimal health and performance. Monocalcium Phosphate, Dicalcium Phosphate, Salt, Calcium Carbonate, Corn Gluten Feed, Potassium Chloride, Wheat Middlings, Magnesium Oxide, Zinc Sulfate, Manganese Sulfate, Copper Sulfate, Sodium Selenite, Ethylenediamine Dihydroiodide, Cobalt Carbonate, Dried Aspergillus oryzae Fermentation Product, Mineral Oil, Copper Proteinate, Vitamin E Supplement, Vitamin A Supplement, Vitamin D-3 Supplement, Natural and Artificial Flavor. Mix this Type B medicated feed with non-medicated feed ingredients to manufacture 1 ton of Type C medicated feed for beef cattle. Mix 500 lbs. of Cattleman's Blend™ AUREO 3G Medicated Type B with 1500 lb. of non-medicated feed, resulting in a Type C medicated feed containing 1500 g/ton chlortetracycline (750 mg/lb.). Hand-feed to beef cattle at the following rates to provide 0.5 mg Chlotetracycline per lb. of bodyweight for control of active infection of anaplasmosis: 1100 lb. cattle: Feed 0.7 lb. Type C per day to provide 550 mg Aureomycin from 2.93 oz. of Cattleman's Blend™ AUREO 3G Medicated Type B. 1300 lb. cattle: Feed 0.9 lb. Type C per day to provide 650 mg Aureomycin from 3.47 oz. of Cattleman's Blend™ AUREO 3G Medicated Type B. 1500 lb. cattle: Feed 1 lb. Type C per day to provide 750 mg Aureomycin from 4 oz. of Cattleman's Blend™ AUREO 3G Medicated Type B. Free-choice salt can be provided.